In this guide we turn up the damage meter to maximum. I won’t beat about this bush, this build guide deals serious damage and is capable of one-shotting players who aren’t paying attention or who themselves are berserker specialised. Be warned, it takes skill to survive with it and perfect timing. 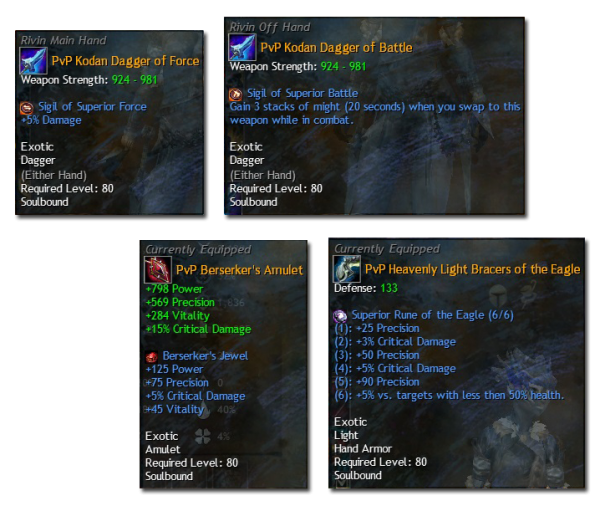 Please Note: This build transfers directly to PvE and WvW, you simply need to buy Berserker items. 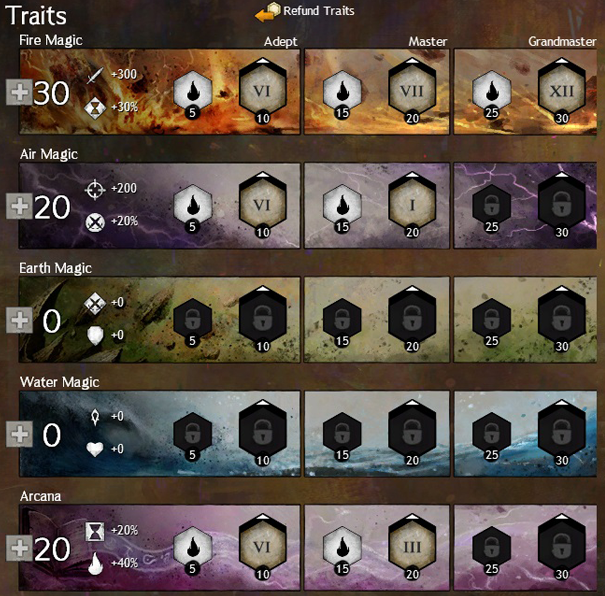 Please Note: If you find yourself dying too often to conditions, swap out 10 points from Fire Magic and place them into Water, taking the trait Cleansing Wave. The entire purpose of this build is to deal massive damage. The only survivability is through the elementalists quick movement and general dagger/dagger mobility. You will die almost instantly if focused, but with clever play you can last a considerable amount of time. I designed this build because too many elementalists choose to bunker and I wanted to find something that actually used the fire and lightning trait lines. There is no suggestion here that the build is ideal for all tournament play, as it really shines from sneak attacks on the control point. The fact that your attacks deal more damage the weaker your enemy gets makes this excellent for finishing other players when your team mates have done the work. Having hit opposing players for as much as 8,000 on a single skill it really can wipe the floor with large groups it simply requires practice and patience. Getting frustrated when you die quickly doesn’t mean it’s a poor build, you just need to choose your fights and your moments. Tagged Amount Of Time, Appid, Build, Bush, Cannon, CannonDaggerDagger, Combat Speed, Dagger, Elementalist, Enemies, Fire And Lightning, Fire Magic, Glass, Guide, Ideal, Massive Damage, Maximum Damage, Paying Attention, Perfect Timing, Quota, Suggestion, Survivability, Truely.